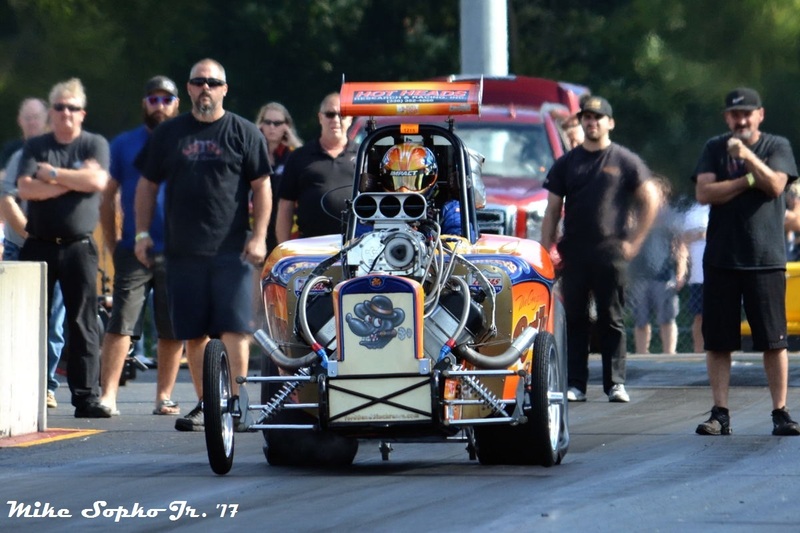 Words & photos by Mike Sopko Jr. - Photos by Mike Sopko Sr.
Wild rides and quick times were the theme for this year’s Northern Nationals. 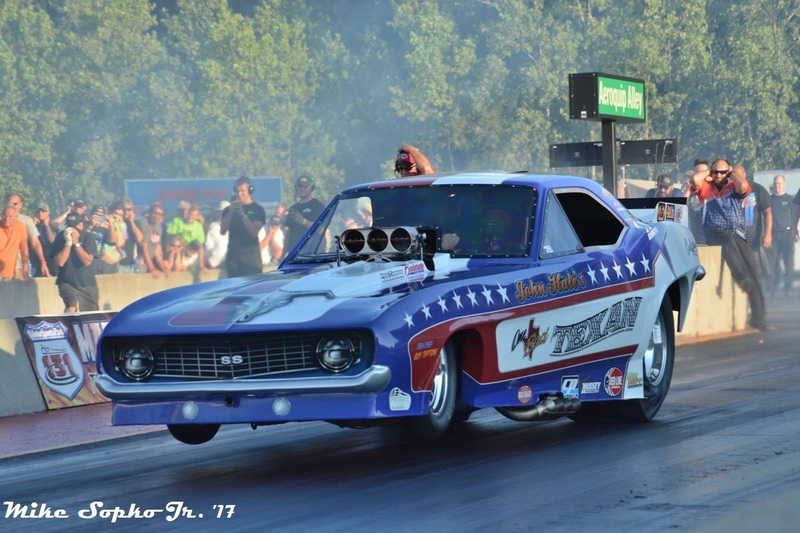 As it has been well documented there were no official points earning IHRA national events this year. 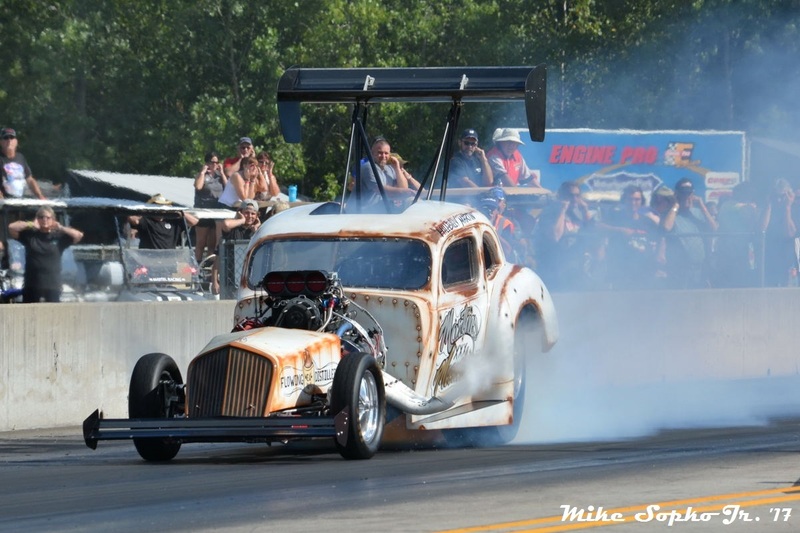 However, that did not stop the team at US 131 Motorsports Park from putting on an outstanding show. 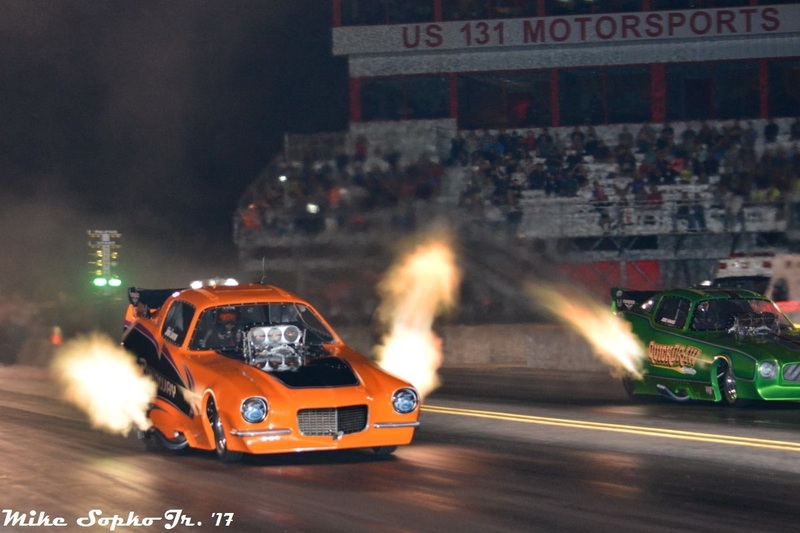 The show kicked off on Friday night with six nostalgia funny cars, a fuel altered, and several jet dragsters each making two hits. 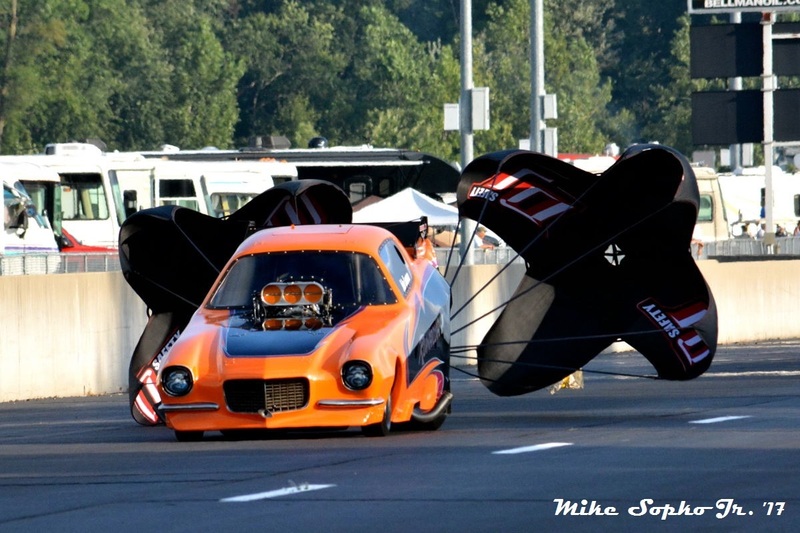 The funny cars of John Lawson, piloted by Joe Haas and himself started the weekend’s assault on the senses. 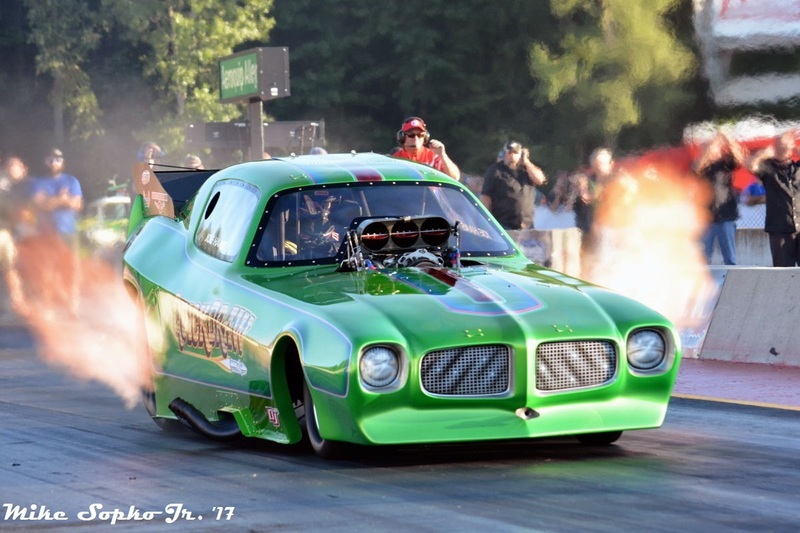 These “outlaw” nostalgia funny cars do not follow the Heritage rules, and instead use larger fuel pumps and blowers among other things. What it creates is a nostalgia feel with big show flames. Friday saw Lawson reach the finish line first both times, as Haas’ car struggled to keep the power to the pavement. Meanwhile Lawson ran a best of 5.40 at 269 mph. The Heritage/DRO legal funny cars of Kevin Lennon, John Hale, Mike McIntire Jr., and Paul Romine rounded out the funny car field. After two passes McIntire lead the field with a 5.58 backed up by a 5.53 in the second round. Romine had two 5.69 efforts, Lennon had to shut off on his first pass, but returned with a 6.74 in the evening. Hale struggled on both passes getting out of shape on each run and being forced to lift. Troy Martin was in attendance as well with his “Martin’s Moonshiner” fuel altered running a similar set up to that of Lawson’s. Martin’s first pass saw him drive it straight down the 1320, however his second pass kept with the theme of wild rides as Martin wrestled with the car and tried to keep it in his lane. However, it seemed to be lifting the wheels and trying to drive it towards the centerline. Eventually, the car crossed the center stripe and took prey of a couple innocent orange Styrofoam blocks. That concluded the nostalgic activities for Friday night, but it was just a sampling for what was too unfold on Saturday. Saturday, much like Friday was met with chamber of commerce weather conditions that had many a crew chief chomping at the bit for the evening sessions. Also part of the Saturday festivities were six Top Fuel Dragsters, and five vintage fuel altereds. Also in attendance was about every nitro lover within the greater Michigan, Ohio, and Indiana area as it was a standing room only crowd. As five o’clock approached the fans were treated to what was called a “nitro teaser.” The teaser consisted of a session of fuel altereds. The crowd filled the stands and stood along the fence to get a taste of the action and the altereds did not disappoint. Seldom if ever have I witnessed such an outstanding performance by the short wheel-based, ill-handling machines. Each pair brought side by side mid to low 6-second passes. 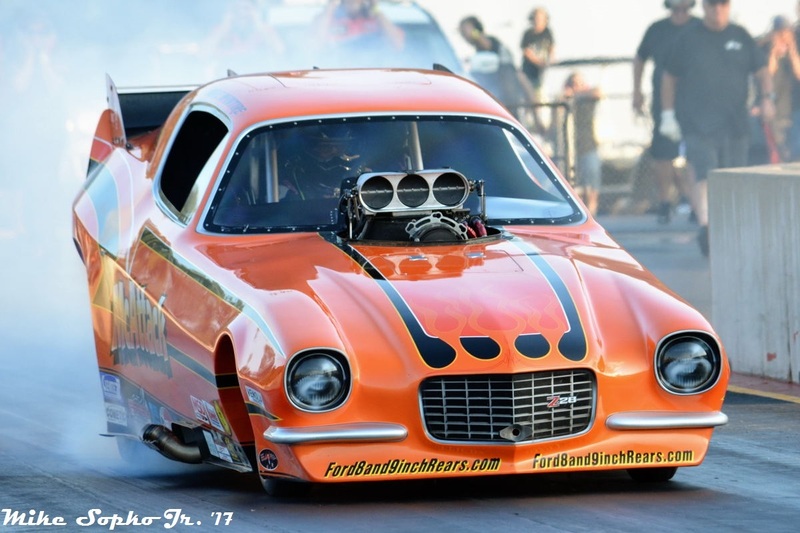 It kicked off with Randy Bradford in his Fiat against Mike Hilsabeck’s “Arizona Thunder” 23-T. Bradford who was just coming off of a career best the previous weekend in Seattle bettered his time from a 6.23 to a 6.21. Interestingly Bradford only ran 200 mph, meaning the engine quit before the finish line and that there was more ET to be had. 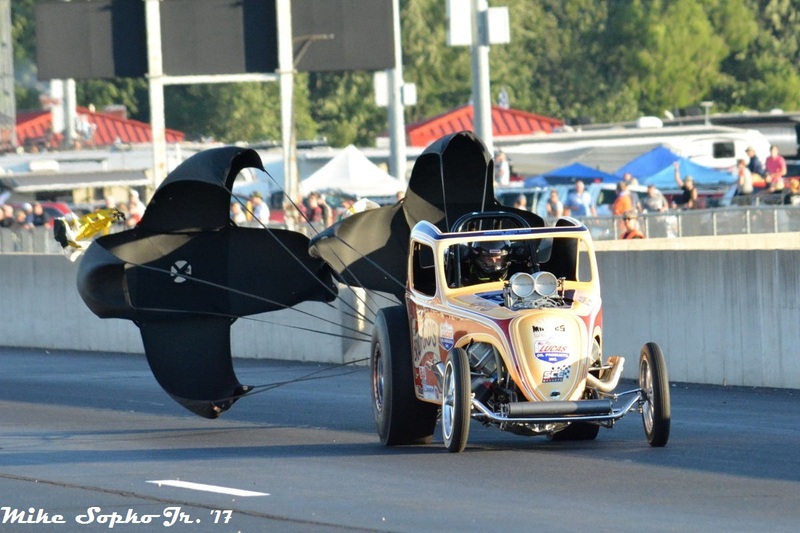 In the other lane Hilsabeck thundered to a 6.41 at 213 mph. The next pair brought back “Martin’s Moonshiner” to take on the legendary “Nanook” piloted by Vince Generalao. Keep in mind Martin’s car runs a different set up and makes more power than the more traditional altered of Generalao. 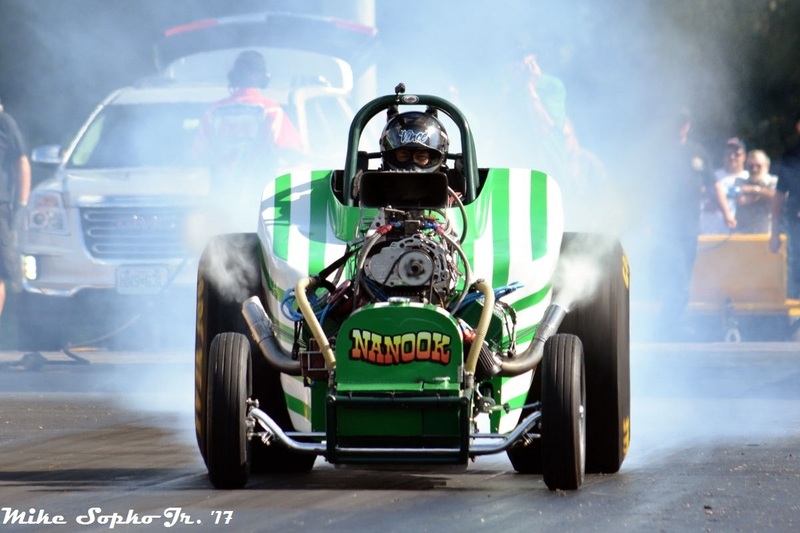 This is evident in the fact that “Nanook” does not run a wing for any downforce at all while, Martin’s car utilizes a top fuel wing in the back and another in the front to keep the front wheels on the pavement. Martin’s car set low ET and top speed of round one with a 6.13 at 237 miles per hour, to Generalao’s very game 6.26 at 233 mph. The last pair would feature two Bantam beauties. Those being the Loaring, Davies, and King “Havoc” coming all the way from England to do battle with Ron Hope’s “Rat Trap.” Both cars left with front wheels dancing off of the pavement. As they traversed the quartermile Nick Davies was able to extend the lead in his green Bantam and recorded an ET of 6.34 at 234 mph to Hope’s 6.55 at 195 mph. At the end of the session the crowd was a buzz and the hook had been set for the rest of the evening’s action. 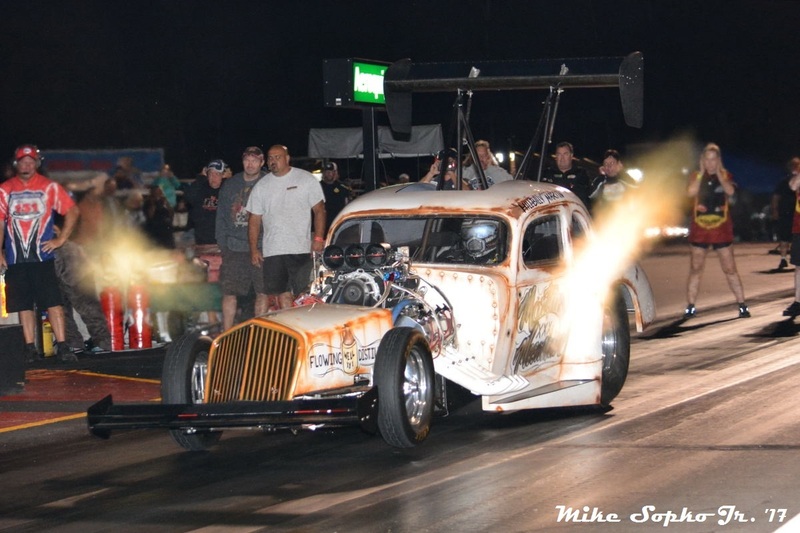 As the clock chimed seven and the pre-race ceremonies were completed the fans were treated to the thrills of six big show Top Fuel dragsters each trying to run over 300 mph in the quartermile. Next, the funnies returned for their second act. It began with Lennon running McIntire. McIntire as you may recall had been on a tear and everyone was wondering if he could surpass Jason Rupert’s track record of a 5.52. To everyone’s surprise McIntire, went up and smoke and valiantly tried to pedal it and get around Lennon. Unfortunately the orange Camaro could not regain traction and Lennon sped away to a 6.42 at 213 mph for the surprise of the event. The next pair brought Romine against Hale. Romine would try to capitalize on his performance from the day before, while Hale would try to tame his “One Bad Texan.” As the ambers flashed both cars launched with Hale’s car continuing to climb towards the sky. At about 100’ he finally had to lift and the car came crashing back to earth. 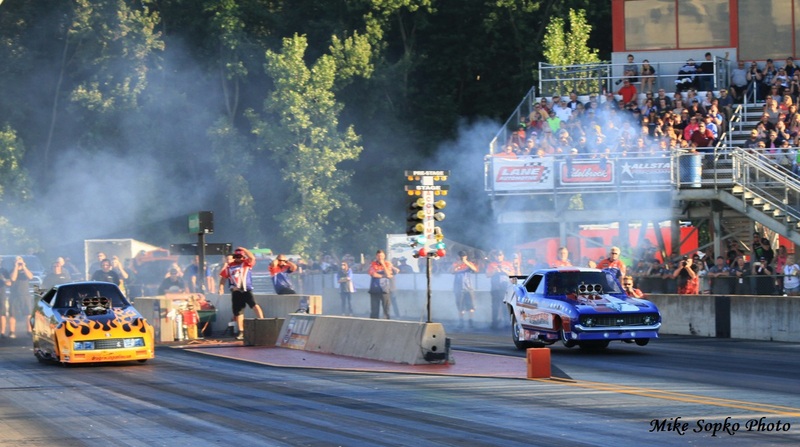 In the other lane Romine rocketed to low of the round with a 5.96 at 244 mph. Haas and Lawson would finish up round one with the funny cars. And this time, both cars lit the candles through the traps with Lawson again taking the win with a 5.66 at 272 mph to Haas’ much improved 5.85 at 264 mph. The second session of nitro was concluded with the altereds that had wowed the crowd earlier. Standing tall after the final session was Vince Generalao who bested Martin’s early time with a 6.11 at 231. Randy Bradford also improved with a 6.18. The final round of the evening began shortly after 9 pm. The funny cars took to the track first with the same pairings as earlier. This time Mike McIntire Jr. returned to his 5.5 something ways and ran another outstanding 5.58 to Lennon’s ever improving 6.29. Next Romine and Hale would try to better McIntire’s performance. Hale again carried the front wheels and had to lift, while Romine thundered to 5.66 giving the event win to McIntire. Haas and Lawson then took to the track. Haas had to lift before the finish line, but still managed a 5.88 while Lawson ran a 5.44 at over 270 mph. Lawson and Haas delight the fans with big show style flames!